With many terrific options, buyers are often confused when comparing hot tub seats to fit their needs. Is health and wellness a priority? How about entertainment? Choosing the perfect seats to fit your lifestyle is easy with the right information. 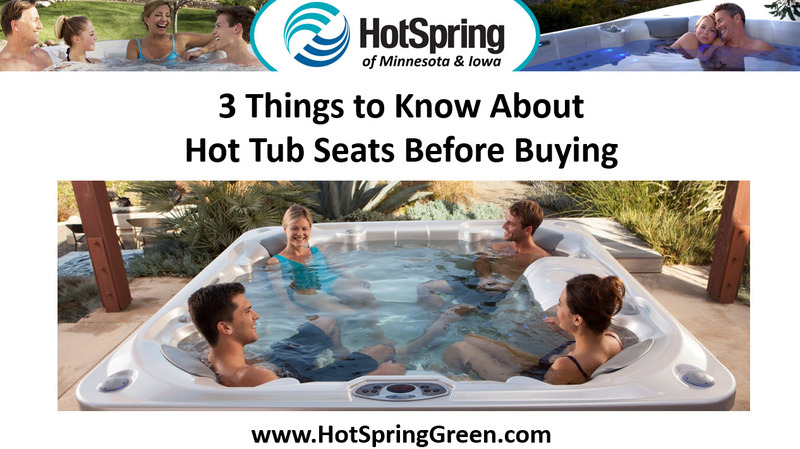 Here’s what you should know about selecting hot tub seats. Comfort Is Everything – Hot Tub comfort means room to stretch out and recline, a soft place to rest your head, and jet clusters that target major muscle groups. A comfortable seat, whether it’s a high performance lounger or a bench, means you can relax and enjoy your spa without floating away. Choose Seating That Fits Your Goal – If hydrotherapy is your ultimate goal, it makes sense to look at lounge style seating with optimized hydro massage. If you plan to entertain large groups at one time, bench style seating may be the better alternative as more people can use the spa at once. A Wet Test Is Critical – Reputable dealers are generally happy to schedule time for you to try out a few models you are interested in. A test soak is critical to find the one model that meets your needs. Consider how different seating options feel while submerged, pay attention to massage as well as placement of head and feet.